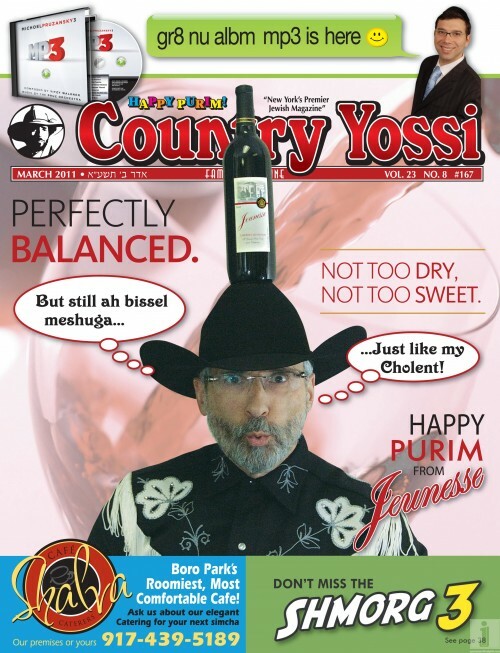 This Friday Country Yossi Magazine #167 hits stores everywhere! Everyone who is anyone knows that the Purim issue is the most sought after issue. This years issue features articles/interviews on Michoel Pruzansky’s latest smash album MP3, Badchen and Rebbe Yoely Lebovitz with his latest comedy CD Boon-dash and the world renown Oorah Shmorg 3 featuring the Mashal Man 2, The Living Torah Museum’s Perek Shira, Fiveish Dance, Yankel Am Ha’aretz, Abie Rotenberg singing Yeshivishe Reid with ALL NEW LYRICS and more. So make sure you get your copy this erev shabbos.